We work directly in communities, allowing for the transfer of skills to community members and caregivers. Our presence in the community is essential for connection and determining needs, as well as designing and testing new programmes before training others to use them. We position all of our work within a community development model to increase the community’s capacity to respond to the psychosocial support needs of children and families affected by trauma, poverty and loss. Our approach involves intensive work in a specific geographical area for 3-4 years. The time frame is determined by the unique needs of each community and the time that it takes for individuals and groups to take up the needs of children, youth and families, as well as increase competencies to ensure independence and sustainability. Increased Play with children at all levels of the community. Play is vital in all aspects of child development. It is not only for leisure and recreation, but is also a key way in which children form attachments with caregivers and others, how they learn, develop and communicate. Play offers access to freedom of expression, thought and opinion. Play is also the language in which children express, process and make meaning of the life changing events in their lives and a key factor in how they learn to coping with difficulty and develop resilience. Play for Healing is central to our work. We train local caring community members to run bereavement groups for children and caregivers that use play as a means to reflect on death and loss, to strengthen coping and improve relationships. Increase responsive care through the Parenting relationship. Parenting and family care is critical in all aspects of child development, care and protection. Parenting in the context of poverty, loss and trauma is made more complex by the high burden of care, the impact of grief and loss, and the caring for and disciplining of children who are not your own. Our work centers on strengthening relationship based parenting for the optimal care and development of the child in the home. This relationship based care can be provided by parents, grandparents, extended family and other adults in the household. Learning to show love, give praise and acknowledgement is the base on which all learning and positive parenting is built. 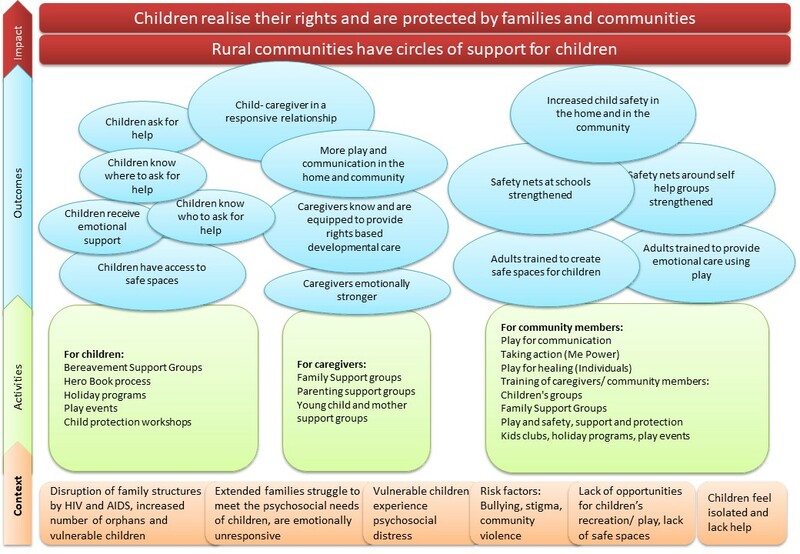 Increase Child Protection for children within the home and the broader community. Our Child Protection Process involves sensitizing participants to the risks in their community facing children; their responsibility to safeguard and prevent neglect, abuse and harm to children; and, finally to know what to do when a rights violation of a child has occurred. We look together at steps to take, exactly who to refer to, what to do and what not to do. This is practical and actionable. It is about right here and now in this house and this neighbourhood, what are the risks, how can we protect, and what is our plan of action if a child needs protecting. This work includes building the capacity of local community members to run child participation processes where children can give expression to where they feel safe or unsafe, and to identify and access support for those issues that raise concerns for them. dlalanathi as an organisation has a living Child Protection Policy. All staff are trained and are required to sign our policy which is reviewed every 2 years to ensure that it is relevant and guides our practice. Police checks are completed on all new staff and social work students based at the organisation. A Child Protection Code of Conduct designed by our staff governs all of our interactions with children.